Whether you are developing a new health clinic or building a franchise expansion, it’s essential to work with a local drywall company with the skills and experience needed to provide ideal results on the first try. You can benefit from hiring a team who can deliver complete quality from start to finish. In most cases, this can include a number of construction services, including stud framing, drywall finishing, and more. 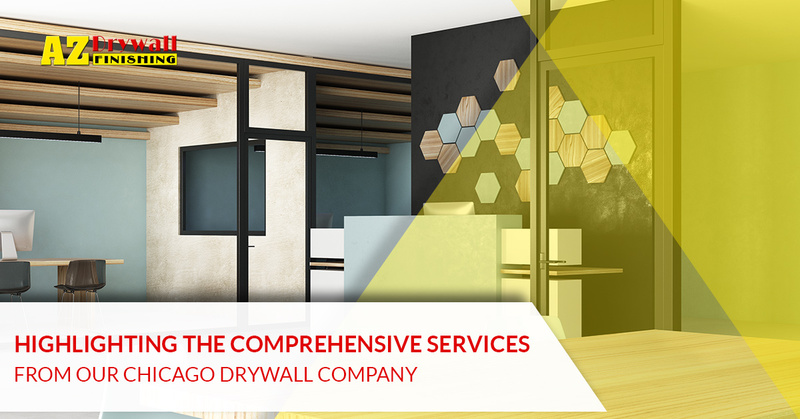 If your Illinois business is ready to secure assistance in getting the job done, AZ Drywall Finishing of Chicago is here and ready to get to work. We’re proud to be your source for top-notch drywall services. Today, we’ll discuss our offered services to help you create success for your building from day one. Ready to get started? Request your free estimate here! Steel framing continues to become a more economical and reliable choice in the building industry. Our metal studs resists pests and termites, offers superior stability, and won’t combust. No matter the shape or scope of your new building or addition, our framing contractors can work to create cost-effective results that set the pace for a fast, professional finish. Metal studs will not shrink, warp, or split, and the result may prove more cost-effective over traditional materials. Contact us online to learn more about our steel framing services, and be sure to ask for a free estimate for all of our services! Sanding, taping, mudding, and more can be done to produce an ideal result that will turn your vision into reality. Our drywall company relies on modern training and stringent standards to ensure that your building is outfitted with the best results and long-lasting benefits. We strive to deliver perfection with all of our drywall services, and will be happy to help you find the right fit for your industry-specific needs. Once your framing is ready, our drywall contractors will get to work hanging and installing boards to encapsulate your facility in a manner that is both beautiful and thermally effective. AZ Drywall Finishing is here to enhance your building, relying on our cost-effective process and experienced professionals to provide an ideal result on budget and on time. Once your drywall is hung, work begins to detail your building’s surfaces for a lasting result. It is essential to create an ideal finish to showcase the quality of your new interior. Keep in mind that metal studs can support a variety of finishes, including cement textures. Our drywall finishers can deliver results to match a range of expectations, including tile, plaster, and paint. Delivering clean results on time is what we strive for, and our drywall team will be able to cover your surfaces with high-quality finishes. AZ Drywall Finishing has built a reputation on quality and affordability, and our painting services can help to improve your bottom line. From high-quality ceiling tiles to perfectly designed grid systems, our team is here to create an effective system that minimizes sound transference. Apartments, hospitals, and every facility in between relies on effective floor designs to create a comforting space for guests and customers. Our commercial drywall pros can help you find the most beautiful and acoustically pleasing designs, including ceiling canopies, ceiling clouds, acoustic tiles, and more. Ready to create a plan to equip your building’s ceilings for acoustical success? Reach out to our Chicago contractors today, and we’ll be happy to discuss how to achieve an ideal outcome. 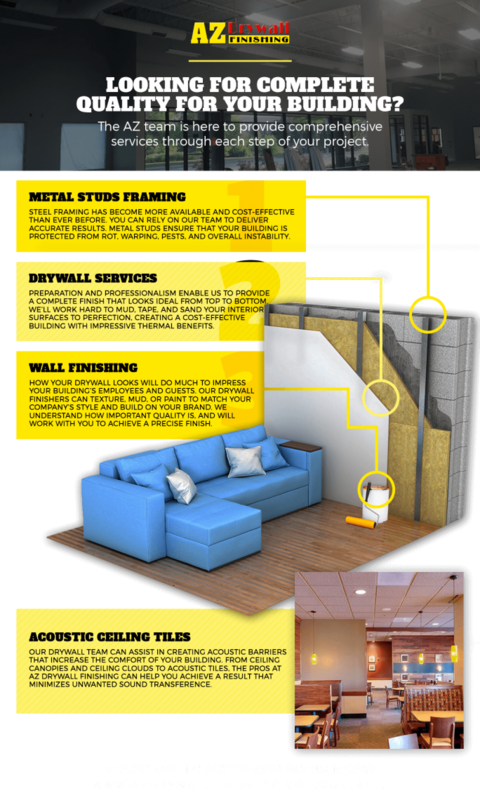 AZ Drywall Finishing is here to provide customers with amazing results, plain and simple. We understand how to safely and effectively complete projects of all sizes across numerous industries, and will walk you step-by-step through our process. Contact us today to learn more!